The plastic cable lockout device, MFL-2P, from Cirlock is intended for use when locking out equipment, such as fuses, circuit breakers, and inside cabinets, where live terminals can be present. The MFL-2P lockout device is without any external metal parts, and has a one metre plastic cable with five mm thickness. These lockout devices can keep metal locks away from any live parts, outside cabinets, keeping trades people safe. 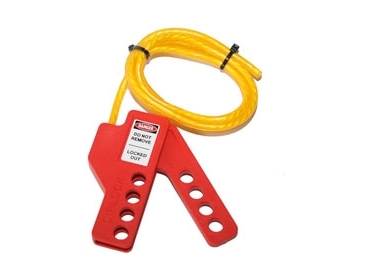 The MFL-2P plastic cable lockout device accommodates four padlocks with up to 8.5mm shackle size. The lockout devices are also available with two metre cables. Cirlock manufacture Lockout Devices in Australia from the year 1992, and have a wide range of lockout products, to suit Australian used equipment.